When you travel in the long time, did you suffer from some pillow problem? Right here, our Travel Bo U-Shape travel pilow can cradles your head and neck in a comfortable position, making it easy to sleep on the plane, train or in a car. (10)Use it on a plane, car, or anywhere you need the extra support for your neck and shoulders. INFLATE WITHOUT BLOWING: Travel Pillow inflate in 30-60 seconds by repeatedly pressing built-in inflation pump. Press air release valve to deflate in seconds. SLEEP SOUNDLY: Adjust for the perfect 360 degree support whether your head leans left, right, or tends to fall forward. 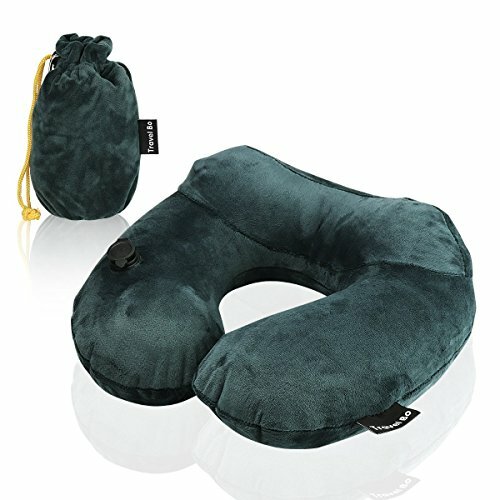 Complete with a flattened rear cushion (perfect for all air travel seats on any flight), this neck pillow is the perfect travel accessory and companion. TRAVEL MADE BETTER: Whether you're driving on a road trip or flying on an airplane to your next vacation destination, the Travle Bo Evolution travel pillow will allow the most comfort and stability on the plane or in the car for the entirety of your travels. SUPERIOR ERGONOMIC NECK SUPPORT: Unlike memory foam, gel or microbeads, you can adjust the size to your preferred inflation level and firmness. IDEAL GIFT FOR TRAVELERS: Our contour U shaped pillows make perfect traveling themed gifts for men, women and kids. If you have any questions about this product by Travel Bo, contact us by completing and submitting the form below. If you are looking for a specif part number, please include it with your message.